In my efforts to get published, I feel like I am slowly becoming part of a large corporation. This corporation has its own company culture which you need to become familiar with in order to move ahead. There is a certain manner of speaking, a way of talking about yourself. You need to be able to acquire friends and influence people. You need networking skills, good presentation; you need to be open and confident. Some get promoted to the upper levels. The talented, that is. Do you too have talent? You won’t know yourself. There are talent spotters in the corporation. You can be lucky and run into one by the water cooler. Or you can try to get the attention of one – be assertive, but not too pushy. Doing your job excellently can be enough to get promoted; it just takes years and years, or else a lot of luck. After some time you want to get out. You feel you don’t understand the unwritten rules, you never will. You want to clear your head of the institutionalised thinking. Just why is someone universally lauded for talent when a couple of weeks before their work was universally ignored? The corporation requires a particular kind of personality to succeed. You have to ask yourself: are you that type? You might instead be an individualist, a non-conformist – a creative type. It was lashing rain when I got off the train in Belfast. I was tempted by the taxis, but thought my euros might take a hit. 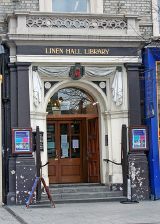 By the time I reached the Linenhall Library I was soaked to the bone. The librarian and administrator of the award, John Killen, greeted me politely enough, but only 5 seconds of politeness. He was busy with the logistics of the day, and waved me ahead for the tea and sandwiches. At that point I was sure I had not won. They always tell the winner in advance at these kind of things, I told myself. I was pleased to see a familiar face on the shortlist, Belfast’s Rosemary Jenkinson. She’s a short story writer and playwright with a play coming up next week at the Old Museum Arts Centre, Belfast. The prize was judged by writer Carlo Gébler and editor Anne Tannahill. The names of the runners-up were announced first. Gébler described the third place story and why he liked it, then called out: “Is Suzanne Walsh here today?” scanning the room left and right. When my story title was called out I enjoyed several seconds of secret fame. Then the photographs and shaking hands began. McLaverty’s daughters and granddaughter were there. I met them again by chance on the train back to Dublin and we had a long chat to shorten the journey. 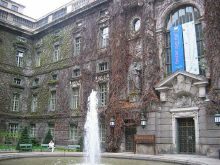 The story was written in the Staatsbibliothek zu Berlin when I lived there. You had to leave your coat and bag at the Garderobe. There was a café attached with cheap tea and coffee. This is where I first began to read German.